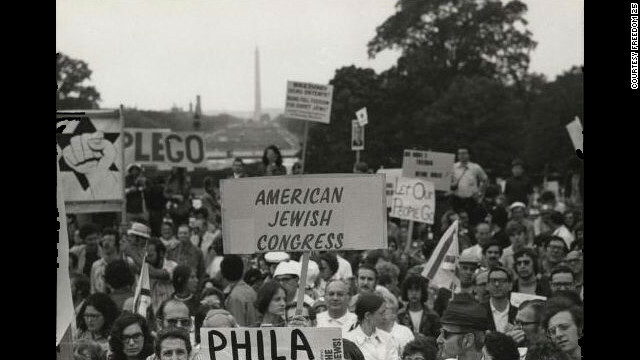 While Jews struggled to leave the Soviet Union for Israel and the West, American activists joined in the human rights battle. If asked to name the monumental chapters in Jewish history over the past century, people are likely to name the Holocaust or the founding of the state of Israel. Overlooked and largely unknown, especially among younger generations, is a tale that spanned decades and transcended politics, people and places. It is the story of a campaign that began in the 1960s and demanded freedom of religion, speech and movement for Soviet Jews – and, by extension, others – who lived behind the Iron Curtain. A new group that wants the Soviet Jewry movement remembered says it belongs in history books, not just Jewish books, and can be a model for confronting human rights abuses that exist now. Even from the early days, this was a movement that spoke to a broader audience. In December 1966, Martin Luther King Jr. spoke about the struggle in big-picture terms when he addressed the American Jewish Conference on Soviet Jewry. 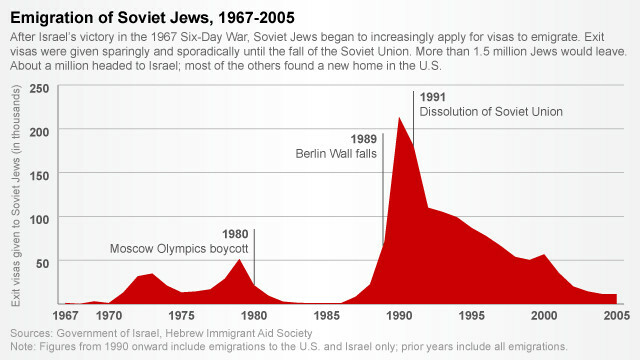 So what was it, exactly, that drove the desire of Soviet Jews to leave? Stalin was paranoid about many things, including Jews. This was only compounded after the establishment of Israel in 1948, a development the Soviet Union initially supported. But when thousands showed up to hear Golda Meir, then an Israeli ambassador, speak in a Moscow synagogue in 1948, the Soviet leader was stunned - and threatened. By the time Stalin died in 1953, Beckerman says, he was reportedly planning large-scale deportations of Jews to Siberia. The establishment of Israel opened Soviet Jews’ eyes to the notion that there was a place they could call home. And in 1948, the United Nations issued its Universal Declaration of Human Rights, guaranteeing that people could return to the home of their nationality, which for Jewish people in the Soviet Union meant Israel. Leon Uris' 1958 novel “Exodus,” about the establishment of Israel, was translated into Russian and became a bible of sorts for many Soviet Jews. The book became off-limits and was smuggled in by outsiders. Zionism was brewing, and the fledgling nation of Israel was eager to welcome more citizens, Beckerman says, adding that early efforts to stoke activism for the Soviet Jewry movement were born in the Jewish state. And then came Israel's 1967 victory over its Arab neighbors. The Six-Day War “worked psychological magic” for Soviet Jews, the author says. They were emboldened, “walked with their backs straight for the first time,” and began to increasingly apply for visas to leave. The problem was the Kremlin didn’t want a mass exodus out of the Soviet Union; such a development would leave cracks in the façade of a paradise leaders had worked hard to paint. So, many who applied for visas were refused. These refuseniks, as they were called, became pariahs. They were shunned by neighbors, lost their jobs and apartments, faced interrogations and were even sent into exile to labor camps or prisons. The Soviets also began to put them on public trial for charges such as treason. In 1970, some Leningrad Jews who were desperate to leave – and had tried and failed to do so legally – plotted the hijacking of a plane. They were stopped and the Soviets, determined to make them an example, sentenced two of the plot organizers to death. This sparked an international outcry, and the sentences were commuted. But the pressure kept mounting as more Jews applied for exit visas, and more activists got involved abroad. International diplomacy and legislation, not specifically tied to Jews, also began to work in the refuseniks’ favor. The Jackson-Vanik amendment, signed into law by President Gerald Ford in 1975, made American trade with the Soviets contingent on freedom of emigration. “It was the first time that a country’s human rights record was linked to America’s trade relationship or American foreign policy,” says Beckerman. "And it was the first time in Congress a bill passed using human rights as leverage." Also in 1975, the Helsinki Accords were signed between 35 countries. In exchange for the West acknowledging the Soviet Union’s post-war borders, the Soviets had to commit themselves to honoring the “Declaration of Principles,” which included human rights issues such as freedom of religion. Beckerman says the Soviet regime was so proud of this accord that it printed the language in the newspaper Pravda, which gave greater ammunition to civil rights activists, both in the Soviet Union and elsewhere. In fact, some, including the most famous refusenik Natan Sharansky, would go on to found Moscow Helsinki Group to keep tabs on how such promises were - or weren't - upheld. Inspired by this, Americans then established Helsinki Watch, which later became the international NGO Human Rights Watch. In the United States, individuals and organizations – bearing names such as the Student Struggle for Soviet Jewry, the Union of Councils on Soviet Jewry, the National Conference for Soviet Jewry – kept applying pressure. Politicians grew increasingly invested in keeping human rights on the negotiation table. Organizations such as NCSJ, the one Levin heads up now, compiled lists of refuseniks – the last book included about 15,000 names – which they presented to Secretary of State George Shultz, who served under President Ronald Reagan. Jews across the map, religiously and politically, came together for a common cause. On December 6, 1987, with Mikhail Gorbachev in office and reforms slowly taking hold, some 250,000 demonstrators flooded the National Mall in Washington. They arrived on the eve of the Soviet leader’s first visit to the White House. Within several years, the doors would fly open. The movement, which played a part in ending the Cold War and bringing down the Soviet Union, would eventually succeed in freeing more than 1.5 million Jews. Sharansky, the refusenik who'd become a poster boy for the struggle, conceived of this rally after his release from prison and the Soviet Union in 1986. He went on to be an Israeli politician, author and human rights activist. And that’s exactly why he and others think it’s time this chapter was remembered. Opportunism and continued interference from US in Russia's history with the well-organized, and financed jewish diaspora. Once the biggest perpetrators of Soviet-Union and bolshevism ran afoul with Stalin (a Gergian) etc. as Israel was now existing, after 1948, economic reasons mainly derived the Jackson-Vanick legislation by the US jewry. There has been a large return of the same people back to Russia as economic opportunities emerged in the past decades! Continuous spin of the facts proves only unrelentness in protecting selfinterests. Throughout the history, suffering has been more uniform than the narrow-minded reporting of this type! I hope for liberty for the Jewish people everywhere. Unfortunetly more often than not, the liberty is not there. However, any Jew can find peace and liberty now. It can be found inside, where it really counts. Yeshua-the Promised One came to suffer and die for our sins so that we might know true peace with God. I have received Yeshua as the Messiah of Israel and seek to follow Him as He leads me. Now I know peace that I never knew before. Baruch Hashem If you have not received Him, ask Him into your life. I guaranty you, your life will change. True peace and liberty is there to be found. Wow you're more arrogant and self-righteous than most of the deluded fucks on here are. What a load of crap article. For those who actually know the history of russia. You will know the Bolshivek Revolution was communist push to take over the country from the christian czar. For those who dont know, Jews created communism, and held most all the power positions under communist russia. Under communist russia, 50+ million christians were killed. So for this article to boohoo about the woes of jews in russia, its more or less a load of crap. They are responsible for far more deaths than Hitler is accused of. I wish Americans actually learned history. Most support a two state solution to solve the Israel-"Palestine" problem. The problem is there was already a two state solution in the early 1900's – Israel and TransJordan and it did not work. Muslims keep demanding more and more of Israel's land. It takes a lot of chutzpah to write a puff-sob story like this one. Glad I have a box of Kleenex nearby. Reald Viktor Slezkine's "The Jewish Century" and see how he gloats (he is apparently Jewish himself) about Jewish participation in the Bolshevik movement – and eventually in the staffiing of the Lenin régime. Also – feel free to consult – "Two Hundred Years Together" by Alexander Solzhenitsyn (still untouched by US publishers)- but available in French on Amazon. What melodrama. What a nincompoop. baltasar, So what? Jews are humans as every other human being. There were "red" Jews' "white" Jews. pro czar Jews, Liberal Jews and most of the Jews were just Jews. Most of the Russian Jews were busy with their Tora, worl and survival. The same as in America today. There are Demo and Rep Jews as of course religious Jews or "Liberal" Jews. So keep your Kleenex dry. It takes a lot of chutzpah to write a puff-sob story like this one. Glad I have a box of Kleenex nearby. You can blame the Jews for the 1917 revolution as you may blame the Blacks for American civil war! ... You can... the question is if you are right. I think that you're totally wrong. So don't blame the Jews for Bolshevism and not for improving the US academy since 1945. You can blame them for being one of the positive historical sources for humanity ! OK let’s talk about the 50 (? I thought you mean 45 years…. Or 64 years….. You have to decide where you stand) , because Palestine is the Roma the Greco-Romans gave to the land of Israel. It’s not an Arabic name. There is no even “P” consonant in Arabic, so how can people call its own allegedly soil with a letter they don’t have? As a matter of fact the “Arab Spring” reveals the truth – there are no Arab separate peoples such as Syrians, Libyans, Jordanian, Palestinian, Iraqi, etc. They are separated into Hamullahs (great families), tribes and religions. The Arabs that live in the land of Israel never accepted the right of the Jews to have their own national state to exist in that land, no matter how you call that land. Even Abu Abbas says it time and again in Arabic, not to mention the other extremists. The Arabs in Palestine and all around (there is no and wasn’t such a State ever, the name is the name of the Land on both banks of the Jordan River) didn’t want to let the Jews to have their state next to an Arab state (the second Arab Palestinian Arab state and the 23rd Arab state) and invaded to the land to throw the Jews into the sea. So, you can call the Jews the oppressors, if you are decent man. The Jews didn’t steal the land from anyone. On the contrary, the Arabs are the thieves. Jews are sitting in the land through the last 4000 years and the Arabs/Muslims are the invaders. Arabs first invaded Palestine in the 7th century. They were always few in numbers. The great majority of Arabs immigrated to Palestine AFTER the Zionist movement of the Jews started to revive the deserted land. Most of the now days “Palestinians” came After 1917. Franklin D.Roosevelt, May 17, 1939: “ Arab immigration to Palestine since 1921 was much greater that Jewish immigration”. Checkpoints? What Americans do in their airports? They don’t do it because the color of your eyes, but because the aggression of Islamic terror. Checkpoints are not ideology but a mean to increase protection. Arab terrorists blow themselves on Jews as remembrance of their ties with the Nazis of the WWII (Haj Amin al-Housseini). It’s not the Jews you can blame but the Arabs themselves . http://www.youtube.com/watch?v=XwBSWN4s9JU Palestinians are a myth says Hamas member of Cabinet "they are just Saudis and Egyptians". USS Liberty? Another lie of those who hate Israel more that they love the truth! This tragedy was amidst of a war and both sides did some mistake. It was proved once and again by many US commissions and investigators. But I guess that you have no other solid issue to blame Israel for, so you are chewing the Liberty in so much liberty and dis-commitment to truth. A BIT OF ADVICE FOR THE PEOPLE WHO ARE NEGATIVE GET OVER IT NO ONES LISTENING YOUR SELFISH WHINING WILL GET YOU KNOW WHERE AND QUITE FRANKLY I CAN'T STAND A CRYBABY SO GET LOST AND TAKE YOUR HATE AND NEGATIVITY WITH YOU! Bonjourno, YOU ARE REAL A BIT OF NEGATIVE SELFISH WHINING CRYBABY SO GET LOST AND TAKE YOUR HATE AND NEGATIVITY WITH YOU! If i compare the French Jews and the American Jews, i chose the french!... The French Jews a more nationalist (+60% anti-socialist (Sarkosy+ext-right)) ....The American Jews are at 82% deeply anti-White, anti-natio, are in fact close to bolchevism!.... They voted at 82% for a black president maybe because they hate white people????? ".The American Jews are at 82% deeply anti-White..." This is a pretty interesting statement considering thatalmost all American Jews ARE white themselves. "They voted at 82% for a black president maybe because they hate white people?????" Probably not. Unlike the racists the Jews (and most other civilized people) can see other features humans have in addition to the color of their skin. The American Jews ARE are much smarter than some alsatian Oklahomem. Gee AB, where is your proof that any of these things actually happened? I'm afraid I'll just have to disbelieve your stories – if they are unsubstanciated stories & not just fairy tales. I actually do know I'm being a pri ck for saying that, especially if it is true...but that's why they say what goes around comes around. If he wrote it in a book and published it, would you believe him? The great Russian writer and dissident, Aleksandr Solzhenitsyn, wrote about the history of Jewish-Russian relations in the book "Two Hundred Years Together" but the book has been suppressed in the US where no English translation has been published because, apparently, it's not "good for the jews". Solzhenitzen onc eremarked: "If I would care to generalise, and to say that the life of the Jews in the camps was especially hard, I could, and would not face reproach for an unjust national generalisation. But in the camps where I was kept, it was different. The Jews whose experience I saw – their life was softer than that of others." In all fairness, he also remarked: "But it is impossible to find the answer to the eternal question: who is to be blamed, who led us to our death? To explain the actions of the Kiev cheka [secret police] only by the fact that two thirds were Jews, is certainly incorrect." Count Yob... Solzhenitzin WAS NOT a Jew. This was the main reason there were no Jews in the camps where he was kept. This means that either Solzhenitzin LIED (which I doubt very much) or, alternatively, his citations you're using here are fake. Jews were in the vanguard of bolshevik communism and they bear responsibility for the deaths of tens of millions of Christians in the Soviet Union and its satellites. When will CNN stop covering up for Jews and portraying them as the "victims" of the communist system they inspired. Remember the Holodomor! I guess all of those Pogroms never happened in Russia eh? The Jews amounted to less than 2% of the population in Russia. Even if every adult Jew was a Communist the Jews could not possibly be blamed for the horrors of Communism. Further, even if some (or even most) Jews were Communists in the Soviet Union 90 years ago are you willing to blame the Jews TODAY for the sins of their Great grandparents? This information is consistent with what I know my family went through wrt to emigration in the 70'S, and their treatment prior to...right down to the notation of "jewish" on their passports. And who owns CNN a subsidiary of Time Warner ? As well as 95% of all media outlets in America ? Oy Vey who could it be. This article is just more Jewish propaganda. Wow..let me reread all of the facts you listed. OOps..there aren't any. Roger Wiggins - And who prevents YOU from owning the CNN or Time Warner or even 95% of all media outlets in America ?